The historic Jamestown Settlement located in Jamestown, Virginia has celebrated many milestones over the centuries. One of their upcoming milestones will take place in 2019, and the Jamestowne Society reached out to Hampshire Pewter to create a piece that would properly commemorate the occasion. With the specifications of our client, we were able to design a unique pewter medallion that is shaped like the first bell in the House of Burgesses. If you look closely at the details, you'll notice the number of rings at the bottom, and the fine detailing at the top of the bell by the hanger. On the back of this beautiful piece, the Jamestowne Society requested that we put some information about the piece. 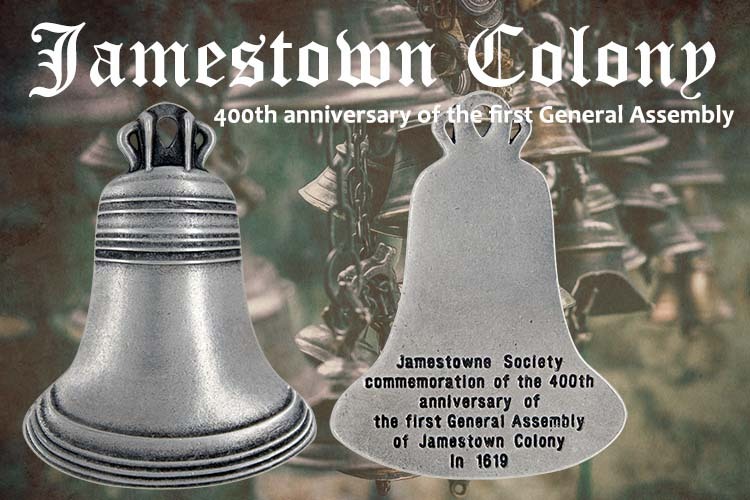 The text reads: "Jamestowne Society commemoration of the 400th anniversary of the first General Assembly of Jamestown Colony in 1619." Interestingly enough, according to the Pewter Collector's Club of America website, pewter was present in Jamestown by 1610. It is our pleasure to be able to craft a commemorative piece for this historic occasion in a material which evokes some of the spirit and history of the site of England's first permanent settlement in North America. View more of our custom pewter works and learn more about the custom process! All it takes is an idea, a sketch, or a picture, and we can begin to bring your vision to fruition! Feel free to give our friendly customer service team a call at 866.282.7384 to discuss your ideas or to get more information on whole process. For more information on Historic Jamestowne, click here. For more information on the Jamestowne Society and upcoming commemorative events, click here.